A late 18th Century diamond devant de corsage, estimated at £60,000-80,000. Photo: Sotheby's. LONDON.- Sothebys London announced that it will offer the personal jewellery collection of Michael Wellby on December 11th 2012. The highly respected Mayfair silver dealer built up a remarkable private collection of jewellery over 60 years, featuring works of exquisite craftsmanship, ranging in date from the 16th to the 20th Century. The single-owner sale will comprise 211 lots with a combined estimate of £800,000-£1,000,000. Highlights include a late 18th Century diamond corsage ornament (est. £60,000-80,000) and a spectacular late 19th Century wheat sheaf tiara (est. £60,000-80,000). Michael Wellby was born into a family of silver dealers. Educated at Marlborough College, at the age of 18, he joined his fathers business H.S. Wellby in Halkin Arcade in Knightsbridge. During the 1940s and 1950s, he began to deal in German silver, (which at the time was unpopular and undervalued), realising that pieces he could buy at little more than melt value were amongst the finest examples of the silversmiths art. In the 1960s he moved the business to Grafton Street in Mayfair, where it soon became a required stop for any visiting continental dealer or collector. During his long career Michael Wellby also built up a highly important private collection of European silver and Works of Art, which he has bequeathed to the Ashmolean Museum. 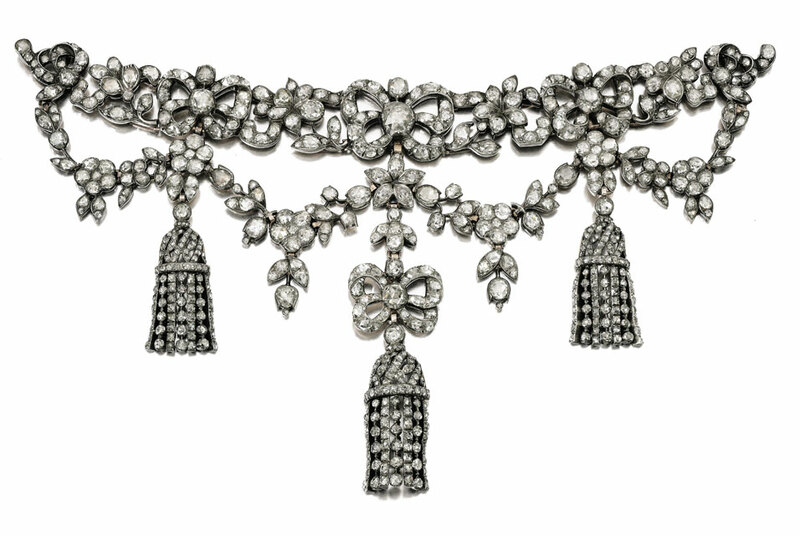 Exemplifying Michael Wellbys quest for works of the finest craftsmanship, one of the top lots of the sale is a late 18th Century diamond devant de corsage, composed of a series of swags with ribbons and floral motifs, suspending three detachable tassels, is estimated at £60,000-80,000. A late 19th Century diamond tiara designed as two sheaves of wheat tied with ribbon bows and set throughout with diamonds is expected to fetch between £60,000-80,000. An Art-Deco, 1920s Tiffany & Co bracelet, with a wide band of geometric design, millegrain-set with variously cut diamonds is estimated at £40,000-60,000. A late 17th/early 18th Century Southern Italian gold and natural baroque pearl pendant in the form of a dancing female carnival figure wearing a floral head dress is estimated at £30,000-40,000. Another stunning example of a 1920s Art Deco jewel is the reversible enamel, lapis lazuli and diamond bracelet, also from the 1920s, is expected to reach £12,000-15,000. One side of the bracelet depicts ancient Greek scenes of women worshipping the goddess Athena and in contrast, the other side portrays a battle scene. Many of the works in Michael Wellbys collection were naturalistic, such as this gold, turquoise, enamel and diamond brooch/pendant designed by G.R. Sandoz, circa 1900, which is estimated at £10,000-15,000. Depicting a lotus flower surrounded by water lilies, the piece is surmounted by two dragonflies, whose wings are set with plique-à-jour enamel, highlighted with turquoise drops, circular and single-cut diamonds. A brooch/pendant by Georges Fouquet, designed as a female figure, with flowing hair and headdress, her face and hair composed of carved chalcedony, applied with plique-à-jour enamel and highlighted with cabochon and circular cut rubies, circular cut and rose diamonds, is expected to sell for £12,000-15,000. Temporary loans to Currier Museum of Art include Edgar Degas' "Dance Rehearsal"